I attended the Titans of Direct Response event in Stamford, Connecticut. It took place on September 11-12. "Titans" brought together 14 speakers in two days ... sort of a direct response rock star-esque party. NOTE: If you want DVDs of the gig, click here. • Dan Kennedy • Gary Bencivenga • Greg Renker • Jay Abraham • Ken McCarthy • Perry Marshall • Joe Sugarman • Fred Catona • Eric Betuel • David Deutsch • Arthur Johnson • Parris Lampropoulos • Brian Kurtz • Jay Sung. A strong line up including some speakers who never speak. I'm a direct response copywriter so it was exciting to hear these copywriting rock stars and meet many of them. My thoughts about the event. Flew from Charlotte into White Plains/Westchester airport. On the approach, I spotted a swimming pool shaped like a violin. More on that later. I was surprised I didn't see a bridge over the pool but there you go. Met Joe Sugarman in the airport. Great fun and I'm now the proud owner of a Batman credit card. Hats off to Roy Furr for writing the copy. The room was packed so the copy worked. Shared a "limo" to the hotel with Casey Stanton, a developer and direct marketer from New Orleans. He invited me to speak about direct response copywriting at a marketing class he teaches at Tulane University. Or maybe I invited myself. Either way, I'm going to New Orleans thanks to Casey. The event took place in the Stamford Marriott, one of those whopping hotels with a lot of really ugly carpet. But the staff were helpful and pleasant. Enjoyed an excellent dinner with 10 other copywriters on the Wednesday night. There were 300 people at the event but around 30 copywriters. Supply and demand. Just saying. Even in the initial mingling, it was clear the event attracted serious direct marketers. There was Gary Bencivenga in the lobby when I walked in. Hello! The networking was superb and I met several strong potential clients. However, I set up several meetings before the event, which is the key to managing a big room. I saw some current and past clients but nobody who owes me money so there were no fights. Titans commemorated the life of Marty Edelston, the founder of Boardroom, which is an information publishing company. Edelston's daughter, Sarah Hiner, gave the keynote speech to welcome us all. I met Sarah at lunch and she personally introduced me to a key decision maker at Boardroom. It's impressive when the president of a company takes a few minutes to make a connection like that. Class. Brian Kurtz, the organizer of Titans, gave the first speech. Some quick takeaways from a few speakers. Brian Kurtz: Talked about Marty Edelston and Marty's 4 pillars of success. Pillar #3 … surround yourself with the smartest people. 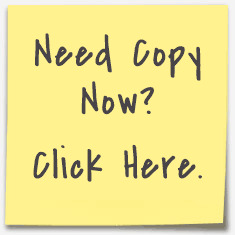 Dan Kennedy: Most readers want to escape … so sell the escape mechanism in copy. Gary Bencivenga: Great copy closes off the “escape” routes. It was awesome to hear Gary Bencivenga and meet a copy hero. Perry Marshall: Understand the different types of story to add punch to copy. Jay Abraham: get beyond “free everything” by providing a quid pro quo. Joe Sugarman: It’s all about making others wealthy and helping them. Greg Renker and his CMO at Gunthy-Renker, Jay Sung. Test, test, then test some more. You’re going to fail. Move on. Fred Catona: Use his proven formula for radio ads. One panel discussion included four Boardroom copywriters. I know all about David Deutsch and Parris Lampropoulos. But not Eric Betuel and Arthur Johnson. It was great to hear everyone's insight. Betuel said it’s important to observe real life so you understand people more clearly; Betuel’s advice was the most powerful takeaway from the event. So I spent the next 3 days in New York City observing life. Interesting! But seriously, that’s superb advice for all copywriters and marketers. Observe real life and imagine what someone is going through so you get a deeper feeling for people's problems. That's such huge advice. I completely fail to understand why, at seminars, after just sitting for 2 days, and doing nothing else except having lunch, I am physically exhausted. I know exactly his predicament. I routinely show up to client meetings without a pen. And I’m a direct response copywriter. The CMO for Gunthy-Renker, Jay Sung, said direct mail might be the next hot marketing technology. Ha! TV as we know it is dead, he added. It was great to meet so many people and so many epic direct marketers. I love working with clients all over the world but I miss actual real live physical interaction with colleagues (and competitors). For someone who tries to stay on the paleo diet, lunch was excellent. Enjoyed great conversations at lunch on both days. Had dinner on Thursday in heaving downtown Stamford with an ambitious young copywriter, Chris Wright, who was here from England. It’s exciting to provide a little advice about developing a career in this crazy business. For the most part, direct response copywriters are collegial. Reason #453 I love this gig. I did not see enough of Stamford to get a sense of what it’s like but the downtown area seemed pleasant enough. The content provided a sensible mix of technical copywriting advice with marketing strategy. I doubt I will ever attend a marketing event with more quality and quantity of swag. I now have huge folders, books, interviews, and more. It was super impressive … and heavy. I'm looking forward to going through it all so thanks to Boardroom for really providing superb complementary content. Here's the physical swag. Hats off to Brian Kurtz and his crew for putting together a super-strong event. It was expensive and there was a time commitment but I’m confident the investment will pay off. Eventually, Boardroom will make DVDs available so I recommend you check those out if you were unable to attend. Full disclosure ... no aff commission! My plans include AWAI bootcamp in Delray Beach in October. Please say hello if you’re there. Contact me here. One final note: you can discover more about that violin-shaped swimming pool here. As you'll discover, I'm not stringing you along. If you want DVDs of the event, just go here.